Priyanka suggests Soumya to think as love angel, not Soumya. She asks Soumya not to run away seeing the problem. Soumya tries to avoid Reyaan and collides with Rudra. Soumya holds him and hides behind. Rudra asks her what is she doing. Rudra holds Soumya and asks her what is she thinking. Soumya is tensed and lost. Rudra decides to obey love angel and gets friendly with Soumya. He asks Soumya not to call him cry baby and dumb Oberoi. Soumya agrees. Rudra asks Soumya about Romi. Soumya wants to tell Rudra about Romi. Reyaan comes and breaks their conversation. Soumya gets angry seeing Reyaan. Rudra asks do you know each other. Soumya tells Rudra that Reyaan is her ex-boyfriend. Rudra gets a shock knowing this. Anika is happy for Priyanka and likes Dev. Anika asks Soumya why did she not confront Reyaan for his doings. Soumya says story ended when he dumped her, and she has nothing to confront. Anika asks her to end the old story so that she can start a new one. She suggests Soumya to end the chapter forever. Soumya says she will try, but they would focus on Priyanka now. Rudra jokes on Reyaan. 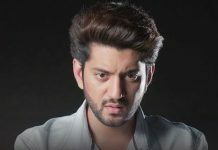 Omkara asks Rudra why is he worried for Soumya. Rudra tells about his friendship with Soumya.